In recent years, the United States has been in the midst of what is known as the Opioid Crisis. Beginning in the 1990s as a result of rampant prescription synthetic opioid use, the evolution of the drug has caused the addiction rate to skyrocket. In 2016, the number of opioid-related overdose deaths was five times greater than in 1999. Now, with the introduction of online sales, it's important to understand how prevalent the threat of opioid addiction is, and how to help loved ones who are addicted get the necessary treatment. While data on overdoses deaths suggests that overall opioid use has increased dramatically, the driving cause of this recent surge is believed to be the sharp increase in the use of synthetic opioids. In fact, this trend - which is the latest in three distinct waves of surges in opioid-related deaths - was largely the result of illicitly manufactured fentanyl (IMF). IMF, along heroin (which was the driving factor in the second wave of opioid overdoses), cocaine, and others have become the primary driving factors of this trend. It is believed that this is the result of prescription opioid use, which acted as a gateway for these more severe opioid variants. The internet has become a go-to method for opioid suppliers to deliver their products to those suffering from addiction. A variety of firms, primarily from China, are willing to mail fentanyl to online buyers through simple online searches. The problem is even worse when you consider what is known as the Dark Web. There, a large variety of dangerous opioid variants can be sold thanks to a variety of suppliers filling the void left by the online drug marketplace known as Silk Road when it was shut down by authorities. As a result, it's much easier for people to get their hands on opioids over the internet. Because the Opioid Crisis has become such a widespread problem throughout the United States, it's not unlikely that you may know someone in your life who is struggling with addiction. In fact, as far back as 2014, 2.5 million Americans have struggled with opioid addiction, As a result, many treatment options have sprung up to deal with the issue. The National Institute of Drug Abuse suggests a variety of effective medications against opioid addiction, such as buprenorphine. There are also dedicated drug treatment centers, such as Pathfinders Recovery Center, which helps those suffering opioid addiction in the southwestern United States. The Opioid Crisis is a serious problem affecting the country today. It affects millions and leads to thousands of overdose deaths. 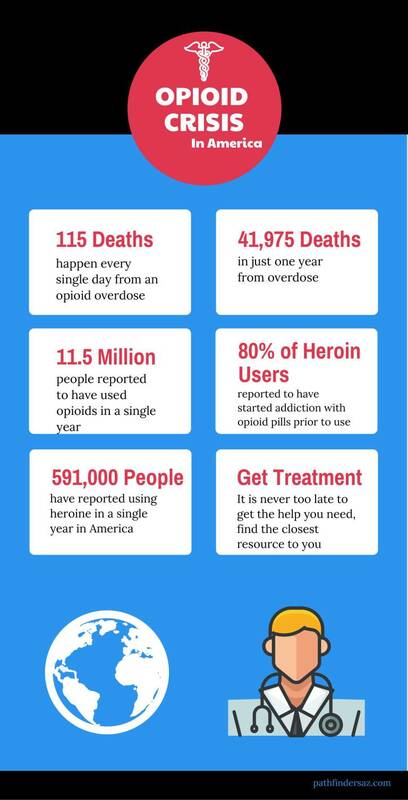 And thanks to various online avenues, getting access to opioids has never been easier. Thankfully there are multiple factors working to alleviate this problem. Perhaps with greater awareness of the problem and treatment options, we can see a change for the better.